Malinda is using Smore newsletters to spread the word online. the ability to be a producer, not just a consumer, of Knowledge. Please use the link to access our school calendar. See what is happening at Rice!!! 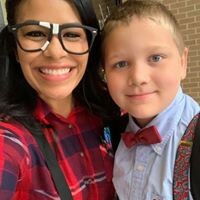 Get connected with our PTO!!! The building opens at 7:30 for students to eat breakfast and go to class. Please do not drop off students before 7:30 as there is no adult supervision. Breakfast is served from 7:30-7:55. 1st through 4th grade eat inside their classrooms. 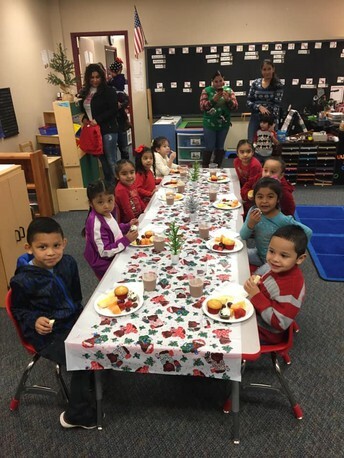 PK and Kinder eat in the cafeteria. Morning PK students go directly to the cafeteria and meet their teachers. Afternoon PK begins at 12:10. If they are going to eat lunch, then they need to arrive at 11:45. Students may not be checked out or change transportation mode after 2:30. This is for the safety of the students. Please make sure you have your car rider sign in your car for car rider. You will be asked to park and come inside if you do not have your tag. Thank you for all your help to make this the very best year!!! 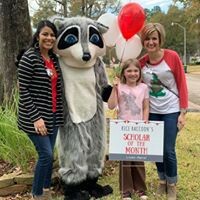 As 2019 begins, I am beyond excited about the possibilities and opportunities we have coming up for our Rice Raccoons. Our students continue to amaze me everyday with their dedication to learning and determination for success. As a parent, your support is critical to success. YOU are important!! Thank you for supporting Rice in 2018 and I look forward to serving your students this upcoming year. We will kick off the new year by giving back to a charity that supports the Leukemia and Lymphoma Society. There will be a calendar of ways to participate going home soon. Welcome Back Rice families! We are so excited to see all of your students today! Everyone seems well-rested and eager to learn. As we get back into the swing of things, it's important to stay healthy mentally and physically. I know as a mom, it's easy to get busy and rush through each day trying to get everything done. However, it's also important to take time to take care of everyone's healthy, fitness, and nutrition to ensure we are at our best at school and at work everyday. Here are just a few things that I've committed to over the holiday break that will be a priority for me and my family. -Eating healthier....this means less fast food and more home cooked meals. This also means "eating the rainbow"...No not Skittles...eating more colorful veggies and fruits and having healthy snack options available. I'm also going to try to introduce my family to new foods every once and while. -Taking time each day for exercise...for me this is huge! I need to make this part of our daily routine...even if it means 5 mins or 30 minutes. Even on cold days, just a few minutes of throwing a soft ball in the house with my kids..or taking the 10 million loads of laundry up and down the stairs. Physical activity will also help them to sleep better at night and allow them to go to bed earlier! -Minimize screen time....this goes for me too. I would love to be the model for my kids that I don't need my cellphone or a device in my hand all the time! Yes, it is a very quiet activity and can be an educational game for the kids, but the face to face interaction and playing with our kids will go so much further for them in the long run. It also helps to add to those memories we discussed in our last newsletter. Staying physically healthy with help us to stay mentally healthy! I would love to hear what you guys are committing to as a family to stay healthy...so have your student come share with me what your family is doing (or email me some other ideas)! Welcome back! I am looking forward to a great semester with all of our hard working students. With being on break for two and a half weeks, getting back into a routine might be a challenge. Here is some great pointers on how to start the day by the founder of Love and Logic, Dr. Charles Fay. Teach confidence by showing it. When parents spend too much time trying to calm their children's fears, their children begin to think, "Wow. If my parents are this concerned about me, and they have to talk this much about going to school, maybe there really is something to be worried about!" More effective parents give lots of hugs, listen, and say, "I love you." Doing this, they send a very strong message of confidence. Simply put, confident parents tend to have confident kids… worried parents tend to have worried kids. If you drive your child to school, leave quickly. Smart parents give quick hugs, let their kids know they're in a hurry, and leave without looking back. Why? Because the underlying message they send to their children is, "You can handle this. You're strong!" It's amazing how children either live up to – or down to – our expectations. Avoid backing down from tantrums and tears. Don't teach your child to be fearful by backing down to crying and allowing him or her to stay home! Regardless of how heart wrenching their cries become, Love and Logic parents send their kids to school. Why? Because all experienced teachers say the same thing: "It's amazing how fast kids calm down after their parents are out–of–sight!" Parents across the country are finding these Love and Logic techniques are easy–to–learn, teach kids to be responsible, and change lives! 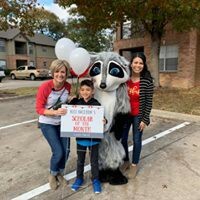 One parent commented, "My six–year–old son was so afraid of school he wouldn't even get out of the car when I tried to drop him off. We were desperate. The day we tried these tips, and had some help from the teacher getting him out of the car, was the last day we had these problems. We're a happy family again! Hope you all have a wonderful January! Families are invited to come enjoy fun activities to promote literacy. 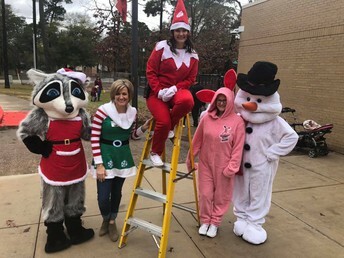 We hope that everyone had a wonderful holiday break! A big thank you to all the parents that helped with the holiday parties! The children were so excited! Please have your child write his/her first name, count 1-30 and read daily! * Write your child’s name on their coats and backpacks. * Keep a clean change of clothes in your child’s backpack. * If you need to change transportation please do so in writing. Welcome back! We hope you enjoyed the winter break and made wonderful memories with your family. We will be reviewing all Kindergarten sight words this month. We will continue to reinforce appropriate reading strategies and behaviors during Reading Workshop. In Writer’s Workshop we revisit personal narrative and story writing. In math we will continue working with numbers 0-20, reading, writing and representing them. In science we will discuss seasons, weather and objects in the sky. 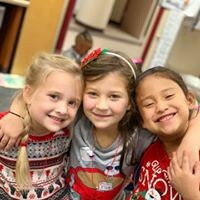 In social studies we will review good citizenship, create timelines and discuss the importance of Martin Luther King Jr. You can support your kindergartener by asking questions about their school day and what they learned in class. Please make sure your child’s name is written inside their jacket. Thank you for your continued support! We are excited about entering the second half of our school year! We are always surprised at how much second graders mature after the winter break. This is the time when we like the students to become a little more responsible and make sure they return their homework each week on time. It is very important that they are studying their math facts, sight words, and vocabulary words. Please continue reading at home each night. The more they read the better they will become in fluency and comprehension. We thank you for all you do to help your children learn and grow academically. May the New Year bring you lots of joy and happiness! Happy 2nd Semester! In math this month, we will be extending multiplication and division from what we have learned in the first semester. We will multiply and divide up 10 x 10 using a variety of strategies including: arrays, area models, strip diagrams, equal groups and repeated addition. We will be applying these skills to one and two step problems. In Science, we will discussing natural resources. Social Studies will be conquering how historical figures and events have helped shape our community. In reading we will be studying the elements and types of poetry! We will read and analyze different forms of poetry. Your writers will also be composing poems this month! Happy New Year from fourth grade teachers and students! 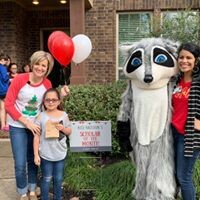 What a busy time of year for our 4th grade Rice Raccoons! Fourth graders should be reading each night to build stamina and skills. In reading, 4th graders will be continuing to learn non-fiction reading strategies as they read biographies and autobiographies. They will enjoy learning about famous individuals and the obstacles they overcame to leave their mark on history. In writing, 4th graders will continue with essay writing as they think deeply about what matters to them. They will compose multi-paragraph essays with clear bold opinions, reasons, and examples. In math, the students are working on division and two-digit multiplication with standard algorithm. Your help at home with these skills is greatly appreciated! Also looked at Geometry. In this unit, we are focusing on parallel and perpendicular lines, and different types of angles. In social studies, the fourth graders have learned about the different Indian tribes and the explorers along with their missions. They are excited to start learning about colonization, independence of Texas, and Texas Revolution. In science, our students have enjoyed learning about electricity, and are looking forward to learning about the patterns of change including four seasons, phases of the moon, shadows, and the planets. We appreciate your support! 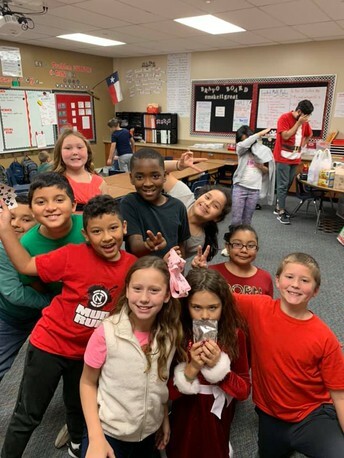 The students worked very hard on their Christmas program. We are glad so many of our parents, family, and friends were here to celebrate the season with us! In addition, a huge THANKS goes out to our wonderful parents for making our Winter Celebrations such a special occasion! We appreciate all you do to support your children and us. Stop by the library the next time you visit our school. We have been adding new books to our collection and we would love to show them to you! Thank you for your continued support of our library program. Our parent volunteers have helped make our library more efficient, effective and fun. I look forward to seeing you and showing you our new books. Remember to ring in the New Year with a good book! Welcome back! We hope everyone had a fantastic break! 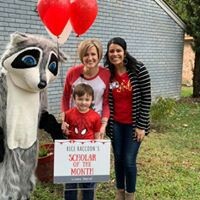 We look forward to a awesome new year with all our Raccoons! We would love to see some new faces in the new year! January 8th will be our next meeting at 11 a.m at the school. If you have any questions please email Raccoonspto@gmail.com!